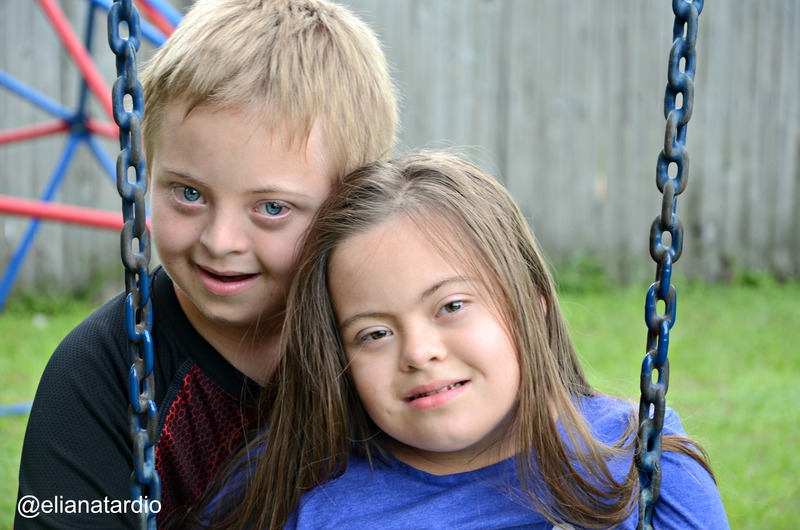 An OSERS Guest Blog post by Eliana Tardio, a mother with two children with Down syndrome. I saw the world breaking apart into small pieces right in front of my eyes. I felt an immense disappointment and a desperate need to blame someone or something. I blamed myself, and then I challenged God by asking him for a proof of his greatness. 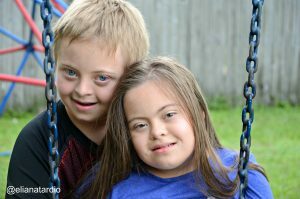 I wanted my child to be cured, just because at that point of my life, I was so supremely ignorant, that I just didn’t know that Down syndrome is not an illness, but simply a way to exist and to be. The following months were tough. I remember living on a roller coaster of emotions between denial and surrender to the incredible love growing up inside my womb. As the day finally came, I didn’t feel any physical pain, because all I wanted to see was his face. I wanted to see how he looked. He didn’t cry, and so, I had only a few minutes to hold him in my arms before he was taken to the NICU. In those hundredths of seconds, I looked into his eyes, and that was enough to fall in love. Down syndrome and all, I realized that he was already the most amazing and perfect child, because he was mine, born from me and to me. You may not believe me now, but even if you never dream of this moment, this may turn into your dream life. All these painful and confusing feelings you are going through right now are just a path to a total transformation of your soul and your heart. Be patient and don’t blame yourself. These feeling are not out of lack of love or acceptance of your child. They are instead a proof of how much you love him, and how much you have to learn. Yes, your child is going to be perfectly fine. He’s going to be happy, he’s going to be smart, he’s going to make you cry out of pride, and he’s going to become your reason to believe, your strength to fight, and your most amazing excuse to slow down and enjoy the small things in life. For sure, there are going to be tough times. Just as you are going to meet amazing people, you are going to be challenged by mean and indifferent individuals as well. They will both teach you something. The first, that everything is possible. The second, that everything can be possible but you have to hold the power to make it happen—and you will. Your child, as any other child, is going to be the reflection of your love, faith, devotion and hard work as a parent. Being a parent is never easy, but it is definitely worth it! And in a couple of years, on top of all the things that typical parents do for their children’s well-being, you are going to be proud to be an advocate, a specialist, an expert and the one who defines his future, has the power to change what needs to be changed, and to create what hasn’t been built yet. You are the parent of an inspiring human being who has no comparison: Your child! Opinions expressed herein do not necessarily reflect the position of the U.S. Department of Education and such endorsements should not be inferred. Eliana Tardio, a proud mother with two children with Down syndrome, Emir and Ayelen. She works as a Program Director for the Parent Education Network and is well known as a diversity and Latino activist that works through her different online platforms to create awareness. Her English website is www.elianatardio.us. A mother with two children with Down syndrome, a Program Director for the Parent Education Network and is well known as a Diversity and Latino Activist. This is a beautiful piece, and you are performing a great service. I once worked with children from birth to 3 years with special needs and their families. I met the most awesome and creative educators while I served in this position. But the person who made the greatest impact in my opinion was the mom of a little girl with Down syndrome. I taught her daughter, Victoria, for her first 3 years, and totally delighted in this little girl. So much of her development and personality was encouraged by her family and their attitude. Victoria’s mother decided to make a video to include in a packet that was prepared to be given to mothers in the hospital who had just given birth to a child with Down syndrome. 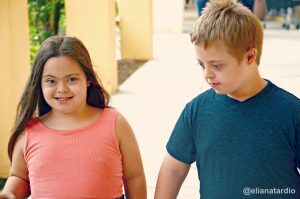 I was able to see the direct impact this video had on parents as they contacted my office and enrolled their children with Down syndrome into our programs. One mom’s decision and compassion had an effect that could never be measured or fully appreciated. Me encanta leerte Eliana!! Tus palabras son motivadoras para todas las madres y reflejan la lucha exacta y el amor que los hijos nos generan, como ningún otro. GRACIAS por ser un gran ejemplo para nuestra comunidad! Siempre es inspirador y motivador leerte Eliana, conocer tus experiencias siempre me anima mucho! Gracias por compartir tus excelentes mensajes de vida! ??? I love this Eliana. No matter what our children are everything to us and their uniqueness will always be something special and beautiful. Desde siempre eres un gran motivo de inspiración para mí. Gracias por compartir tu experiencia Eliana. What a beautiful post. Each kid is a blessing and has so much to offer. Your story is so inspiring and empowering! I have two nephews, they are twins and were born with a genetic disorder as well. Although I saw that my aunt’s life wasn’t simple, she always looks proud. My nephews are so talented. They are 24 years old now. They have their own jobs, one as a baker, and the other one is an electrician. They make us all happy and definitely show us a new way to appreciate the little things of life. Eres maravillosa amiga… Te admiro mucho. Gracias por compartir tu historia y ayudarnos a aprender la vida con comprensión, sabiduría y entendimiento.. Tu sabes que quiero mucho a los niños y los considero como mis sobrinos…. Un abrazo..
Wow! Learning your story is very inspirational. I know that you are a strong and courageous woman and you have given your best to live the best lives they would ever have. You’re “tremenda y especial” Y tus hijos son unos tesoros. I love your testimony, so important to know how our lives can be changed so quickly and something that today seems sad can be the biggest joy later. YOU ARE A MAGICAL MOM. EVERY DAY YOU TEACH ME THAT NO REASON TO STOP YOUR DREAMS AND MOST OR, IMPORTANT IS GIVEN DAY BY DAY. I have to say… my admiration for that mom. My son is 21 and he was born with Charge, is hard but is the most amazing think that ever happen to me. I’m the way I’m, because of him. Moms out there… it’s possible, just believe in them. Warriors.